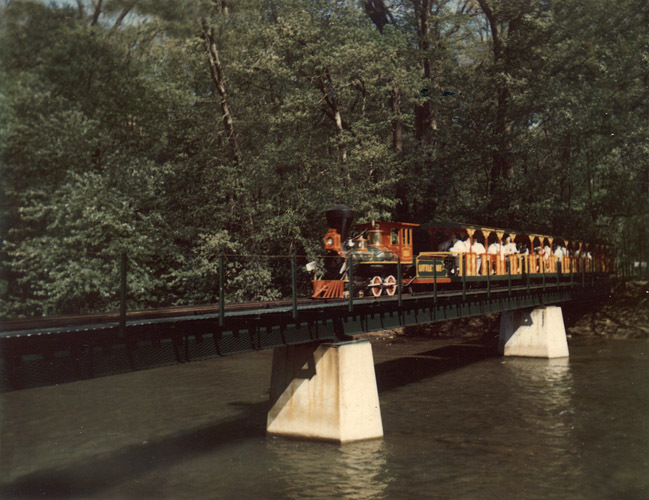 The Loyalhanna Limited was an amusement park steam train operated at Idlewild Park in Ligonier, Pennsylvania from the late 1960's through the 1980's. Today there still is a train riding these rails, but the steam locomotive was replaced by a gasoline engine (a C.P. Huntington) in 1991. The train's original cars still ride these rails, though in the opposite direction that they once travelled. The original engine and its cars were manufactured in the early 1960's by Crown Metal Products Company of Wyano, Pa. This company made many steam trains of various gauges, many of which still run at parks around the country, such as both Busch Gardens parks, Hershey Park, and many, many more. Crown Metal was started by Ken Williams, who ran the company until his death in 1971, when operations were taken over by his son, Bert. The actual manufacturing facility was in Elizabeth Township, Pa., on the Williams' farm. 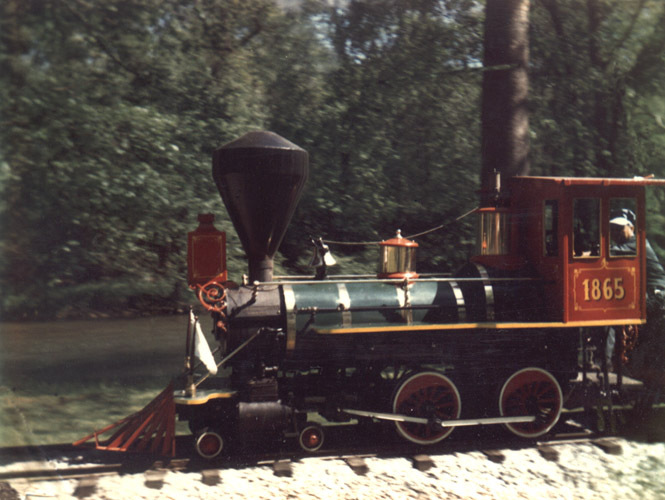 The train at Idlewild, a 24" gauge steamer powered by anthracite coal, was actually owned by Crown Metal even though it was run at the park in Ligonier. Idlewild purchased it from Crown sometime in the 1980's. The Crown steamers have a special place in my heart, as my Dad used to run them for Ken Williams when he wasn't at his "real job" on the B&O Railroad. In 1972, from June 14th thru the 23rd, Hurricane Agnes struck a deadly blow to the United States. The hurricane's track over the country went all the way from the Florida coast near Tallahasee to southern New York State, wreaking havoc all along the way. There were floods along with wind and rain damage all along her path. Though the hurricane did not score a direct hit on Pennsylvania, its effects were still felt far into the western part of the state. Ligonier was not an exception. Loyalhanna Creek, the usually tranquil stream that runs through Idlewild Park, was flooded beyond expectation, and its waters caused tremendous damage to the park, and especially to our little railroad. This web site will show you some of that damage. This is the engine of the Loyalhanna Limited, stopped at the main station in the park. Engines made by Crown Metal often carried the logo "Little Toot" on the tender car, and they were affectionately known as such. That guy at the controls is my father. Click on the "Little Toot" below to begin your ride through the aftermath of Hurricane Agnes. "Pennsylvania Destination of the Day"
The photographs on these pages were taken by an unknown photographer. It is believed that all of the flood photos were taken by Bert Williams, but this is not for certain. 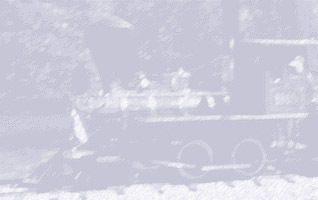 The first two pictures of the train on this page were possibly taken by a professional photographer, but again, that photographer's identity is unknown. The pictures themselves were owned by my father. I found them after he passed away in June of 2000. If you would like to make copies of them for any use whatsoever, please contact me at the e-mail address below. This web site was created by Vincent G. Ferrari on July 4th, 2001. If you have any questions or comments about these pages, please send me an e-mail by clicking here. You can visit my main page by clicking here. I also have another railroad-related page at this address.